Gormlaith Golden-Hilt, a Nord warrior, is an ancient hero currently residing in the Hall of Valor in Sovngarde. She was one of the warriors, along with Felldir the Old and Hakon One-Eye, who fought against Alduin, ultimately sending him forward through time using an Elder Scroll. 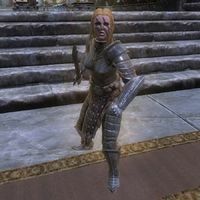 She and her compatriots later assist you in the final battle against Alduin in Sovngarde. Upon returning to Tamriel, her spirit can be summoned using the first word of the Call of Valor shout. She wears a set of steel plate armor, minus the helmet, and defends herself with an ancient Nord sword and a steel shield, supplemented by a long bow with ten steel arrows. She knows these shouts: Dragonrend, Frost Breath, Unrelenting Force, Ice Form, and Become Ethereal. She can use the greater power Battle Cry as well. However, when summoned with Call of Valor, she will only use Dismay and Unrelenting Force in combat. When summoned, she will say, "I serve the Dragonborn." or "Lead me into battle." In combat, she will exclaim, "For the Dragonborn! ", "For Sovngarde! ", or "My sword will taste of your blood!" More information can be found on the lore page. She is voiced by Lynda Carter. Gormlaith that appears during the quest Alduin's Bane: BaseID 000CD9F7, RefID 00044446. Gormlaith that you can summon: BaseID 000923FA (a different RefID is assigned each time she is summoned).